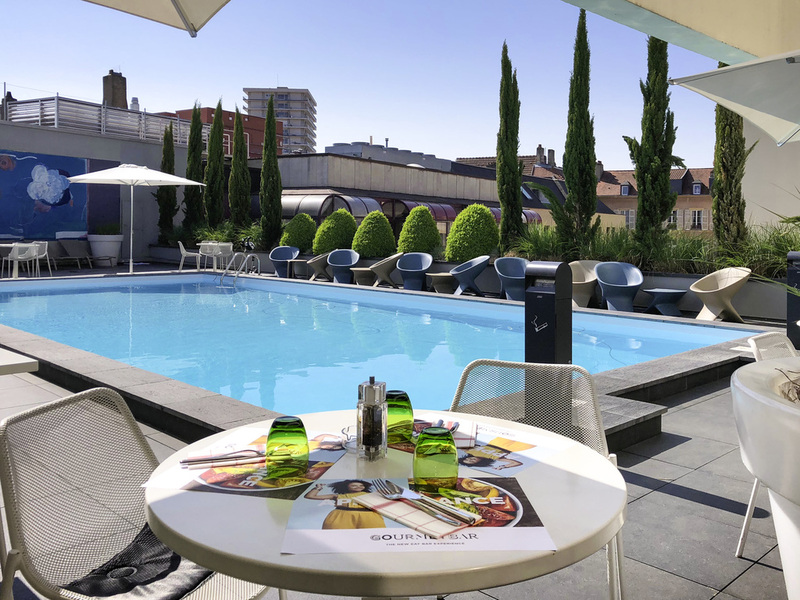 The Novotel Metz Centre Hotel is in the center of Metz. Around and at the foot of the hotel you will find a shopping center, shopping streets, and its main sites to discover the city. Rejuvenate yourself during a stay at the Novotel Metz Centre. From the Standard room to the Suite, the hotel welcomes you in an elegant and comfortable atmosphere. Fitness room. For a successful seminar, ten fully-equipped meeting rooms are at your disposal. Enjoy a gourmet moment on the terrace of the restaurant and discover Metz and its charming pedestrian streets and its Christmas market. Lounge bar and Gourmet Bar restaurant. Brunch served every Sunday. With their contemporary and completely modular design, Novotel's spacious rooms are true living spaces and can be adapted to suit all requirements The Novotel Metz Centre offers spacious rooms which can easily accommodate a family of 4. Choose the Executive Room and enjoy the bathrobes, Nespresso coffee machine and free minibar. The Gourmet Bar by Novotel welcomes you in a trendy setting, in a relaxed lounge atmosphere. Rapid service for lunches, a Sunday brunch, a family meal, a baptism, a communion... trust us and contact us! An open-plan space in a cozy, friendly environment, perfect for relaxing. For business meetings or drinks with friends, we have thought of everything to ensure you have an enjoyable experience. Take a break, enjoy after-work drinks or any other activity.